Exotic fairytale houses set by an enchanted forest. FRANGIPANI HOUSE, fun for the whole family, exotic African-hunting-lodge style. 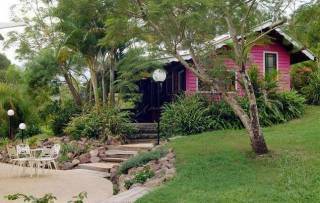 JACARANDA COTTAGE, ideal romantic retreat, with a touch of pioneer history. Piccaninny Cottage all funky and tribal for special retreat. Enjoy rambling entertaining areas, fabulous swimming pool, with childrens' wading area,for outdoor entertaining. Delightful garden pavilion for eating alfresco, parties, celebrations & intimate weddings. 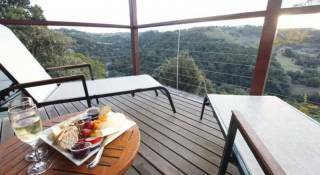 Both houses are fully self-catering for food & wine enthusiasts. Bicycles to ride into the village for foodstore, bakery, bottle-shop, kids playground,& chic sidewalk cafes & restaurants. Enjoy cosy winter fires, hot-tub jacuzzi out under the stars, giant chess-set, croquet & games lawn, historic memorabilia, BBQs & outdoor living. Guests can cook up a storm in the funky wood-fired pizza-oven on delightful piazza-deck... ideal for romance, parties, celebrations, & functions! 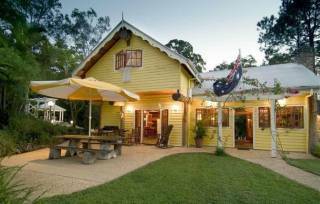 Horseriding treks daily, explore mountains and rainforests, safe horses and cute ponies, close to beaches and markets, wineries all Sunshine Coast attractions. 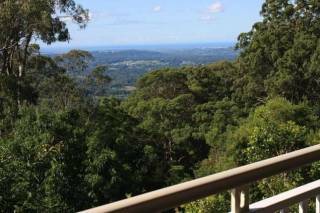 It is a condition of your occupancy that you take special care of Mooloolah Valley Holiday Houses and their contents, and be responsible for any loss or damage. Any breakages, damage or missing items, reported by housekeeping after your departure, will be charged to your credit card. A $100.00 minimum cleaning charge will apply if any of the houses are not left in a reasonable condition. 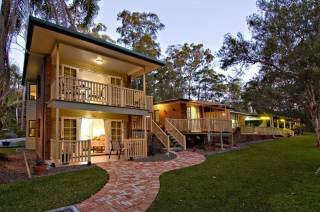 Special effort has been made to provide you with an unforgettable stay at Mooloolah Valley Holiday Houses.